In UNIGINE, a camera has 2 matrices: the view and projection ones. They are used in rendering of the image from the camera to the viewport. In UNIGINE, the view matrix is called modelview. However, in the further text we will use the generic term view to avoid confusion of terms. Before getting to the main aspects of the camera matrices, it is necessary to know peculiarities of the coordinate system used by UNIGINE and refresh general knowledge of vector spaces and transformation matrices used for vertex rendering. 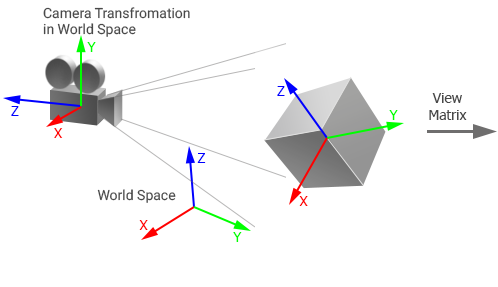 The 3D space in UNIGINE is represented by the right-handed Cartesian coordinate system: X and Y axes form a horizontal plane, Z axis points up. The +Z axis is considered the upward direction. 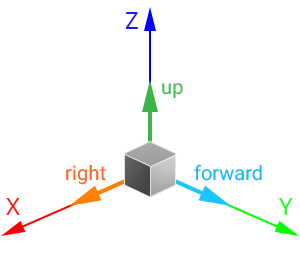 To move the node up/down, translate it along the Z axis. The +Y axis is considered the forward direction. To move the node forward/backward, translate it along the Y axis. The +Y axis is considered the upward direction. 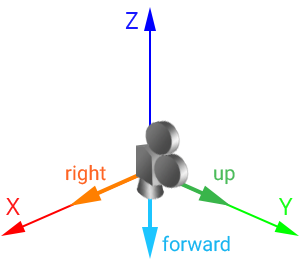 The -Z axis is considered the forward direction. You can change directions for a node via the Node::setDirection()/setWorldDirection() method. Local space is a space in which all vertices of an object are defined relative to the center of this object. World space is a space in which all vertices of an object are defined relative to the center of the world. 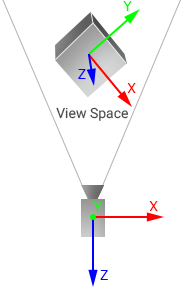 View space is a space in which all vertices of an object are defined relative to the camera. Clip space is a space in which all vertices of an object are defined in a cuboid of [-1;1] dimensions for every axis. The Z coordinate of the vertex specifies how far away the vertex is from the screen. Screen space is a space in which all vertices of an object are flattened and have screen coordinates. World Transformation Matrix stores transformation of the object relative to the world origin. This matrix is used to transform the the object's vertices from the local space to the world space: the matrix is multiplied by each vertex of the object. In UNIGINE, such transformation is performed automatically when the node is added into the world. When a node is added into the world as a child of another node, it has also a Local Transformation Matrix that stores transformation of the object relative to its parent. To transform the local transformation matrix of such an object to the world one, the object's local transformation matrix is multiplied by the local transformation matrix of the parent. To get more information about local and world transformation matrices, check the Matrix Hierarchy chapter. 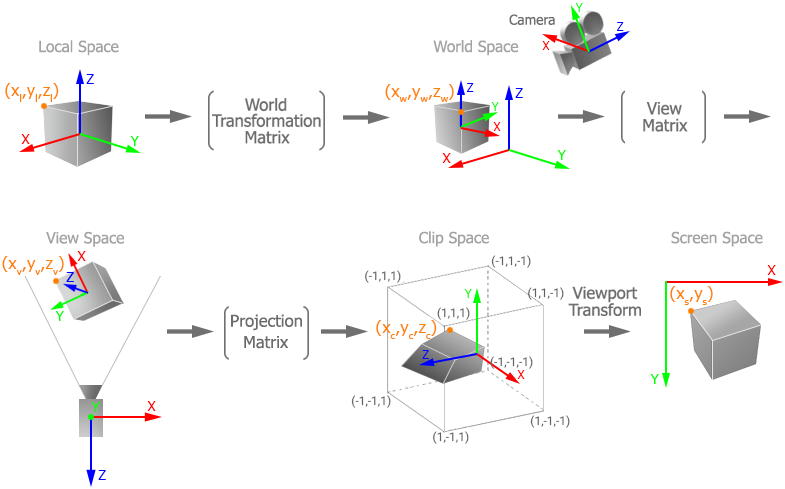 View Matrix is used to transform the object's vertices from the world space to the view space. In UNIGINE, the view matrix is called modelview. Projection Matrix is used to transform the object's vertices from the view space to the clip space. Each node added into the world has the world transformation matrix. However, passing this matrix to a shader for vertex rendering is unreasonable: it will lead to precision loss because of double to float coordinates conversion. For this reason, in UNIGINE, the node is transformed to the view space first: the product of the world transformation matrix and the view matrix is calculated on CPU and passed to the shader. Such matrix is called Modelview (in its generic meaning). Here the ModelviewMatrix is the product of the world transformation matrix and the view matrix. The order of matrix multiplication is read from right to left. In UNIGINE, the View matrix is the 4x4 matrix that controls the way the camera looks at the scene. The view matrix is equal to the inverse camera world transformation matrix: it stores position and rotation of the camera in world space. As it was mentioned above, in UNIGINE, the view matrix is called modelview. The matrix is used to transform vertices of the object from the world space to the view space (coordinates of vertices are set relative to the camera origin): the camera's view matrix is multiplied by the object's world transformation matrix and then the resulting matrix is multiplied by the object's vertices. Coordinates of all points and vectors passed to shaders are converted to the view space (i.e. they are calculated relative to the camera). It is done to avoid precision loss. By default, the projection matrix of the camera doesn't store an aspect ratio of the screen (width to height): aspect correction is performed automatically for the current viewport. If manual aspect correction is done, the automatic aspect correction for the viewport must be disabled to avoid incorrect results. If you change FOV (or width and height for orthographic projection), near and far clipping planes, the matrix is updated. The projection matrix is used to transform vertices of the object from the view space to the clip space. This space is represented by a cuboid with [-1;1] dimensions for every axis and used for clipping vertices: all vertices inside this volume will be rendered on the screen. In this space, the Z coordinate of each vertex specifies how far away a vertex is from the screen. In UNIGINE, the reverse depth projection matrix is actually passed to the shader to perform transformation: in this matrix, elements that store the near and far clipping planes are multiplied by -1.